Ten people have been sentenced for defrauding four pensioners from north Wales out of hundreds of thousands of pounds for non existent, poor or unnecessary building work. They defrauded one person out of £650,000 and another victim was the late grandmother of actor Jude Law. Meinwen Parry, 89, who died in March 2015, had paid out £60,000 for work which should have cost about £3,500. Sentencing took place at Caernarfon Crown Court on Friday. 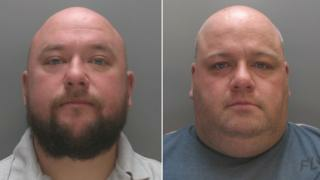 Judge Huw Rees said the level of greed was outstanding. Stephen Jones, 38, from Llangefni, Anglesey, targeted Ms Parry's home at Bangor, Gwynedd. He and Bedwyr Roberts, 35, from Bangor, also took £650,000 in life-savings from cancer patient John Bates between 2009-16, the court heard. They were jailed for eight and six years respectively. After the hearing, investigating officer Det Con Catherine Walker said the case "demonstrated just how low some people will sink to exploit the vulnerable in our community". "These were despicable acts where elderly, vulnerable people were deliberately targeted and deprived of their life savings. "Money that was needed to ensure a comfortable retirement has seemingly vanished and at this point there seems little hope in tracing and returning it to its rightful owner." She said: "Sadly, one of the victims has since passed away but I hope on their families' behalf, and for the other victims, they will at least take some degree of reassurance in today's sentencing." Andrew Warman, senior crown prosecutor for the Crown Prosecution Service, said Jones had "harassed the victims for vastly inflated sums of money", returning to two of them repeatedly for more money. "The devastating impact on the victims was made clear to the court and all the defendants have now faced the consequences of their actions," he said.